Years ago, at the event Southern Fried Comic Con in Jackson, MS, I had the pleasure of speaking on a panel with author Kimberly Richardson. Upon this panel, she and I discovered we had quite a bit in common. After purchasing her book Tales from a Goth Librarian, and she purchasing my book Traumatized, it would be nearly a year before we would see each other again. The next time we bumped into one another was at Midsouth Con in Memphis, TN. The first thing we did was hug one another and then fan girl/boy out over how shocking each other’s work was. It wasn’t long after that I began contributing to her Dreams of Steam Series. 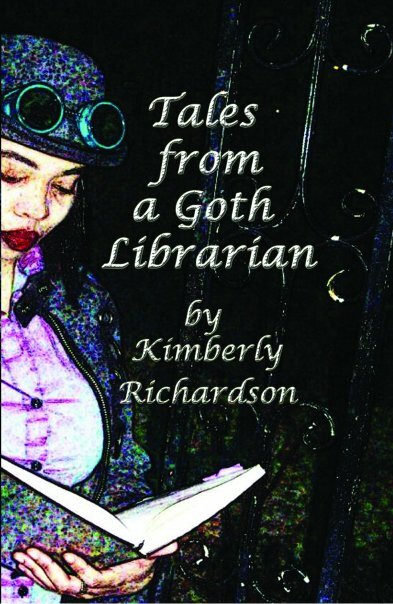 Before we learn what Kimberly Richardson AKA The Goth Librarian thinks of Halloween, here is some of her back story. After found as an infant crawling among books in an abandoned library, Kimberly Richardson grew up to become an eccentric woman with a taste for jazz, drinking tea, reading books, speaking rusty French and Japanese, playing her violin and writing stories that cause people to make the strangest faces. Her first book, Tales from a Goth Librarian, was published through Dark Oak Press and named a Finalist in both the USA Book News Awards for Fiction: Short Story for 2009 and the International Book Awards for Fiction: Short Story in 2010. Ms. Richardson is also the author of The Decembrists (Dark Oak Press) and Mabon/Pomegranate (Dark Oak Press), the upcoming books Tales From a Goth Librarian II, The House of Ginkgo and Open A, as well as the editor of Realms of Imagination: An Urban Fantasy Anthology and the award winning Steampunk anthology Dreams of Steam and the award winning sequels Dreams of Steam II: Of Brass and Bolts, Dreams of Steam III: Gadgets and Dreams of Steam IV: Gizmos, and the upcoming Dreams of Steam V, all published through Dark Oak Press. Ms. Richardson is also a contributor to the anthologies BLACK PULP and the upcoming ASIAN PULP, both published through ProSe Press, Garbanzo Literary Journal Volume III, published through Seraphemera Books, and Luna’s Children: Stranger Worlds, a werewolf anthology published through Dark Oak Press. Other short stories and poetry by Ms. Richardson have been published through Sam’s Dot Publishing/Alban Lake Publishing, Midnight Screaming, and FootHills Publishing. Ms. Richardson is also the Programming Director for Memphis Comic and Fantasy Convention, a sci-fi convention held in Memphis, Tennessee. It means a time to say goodbye to the lighter side of Life and to prepare ourselves for the Dark. It is by no means a sad time rather a time of reflection and of magick. I don’t really have one; every Halloween has been wonderful! I usually just watch a scary movie or pay homage to the dead. This year, however, I am going to see the Shakespearean play Richard III. I love that play and this version should be spooky enough! I dressed up once as a farmer when I was a child, complete with hay stick to chew on! I don’t think I’ve ever had a bad costume. Some people believe Halloween is a negative Holiday to celebrate. Why do you feel Halloween has such a controversy to it? Because although there are “spooky” elements associated with the holiday, people think it to mean the Devil and Satanism. That is simply not the case. Keep them away? Um, why? You know what scares me, Alex. That is my answer! The scariest movie I ever saw was The Orphanage. Scared me so badly I actually hid behind my coat and cried. Yes, I really did cry. Anything dealing with dead children bothers me greatly. Bag of Bones by Stephen King. Something about the story touched my soul and wouldn’t let go. It bothered me to read it but I read the entire thing and, although I’m glad that I did, I will never read it again. I like both, although I tend to write the slow burners. My imagination and the fact that it has no limits. You are currently browsing the archives for the Steampunk category.